Avoid routine use of pharmacologic DVT prophylaxis in elective foot and ankle surgery. The decision of whether to implement pharmacologic prophylaxis should take into account the risk of deep venous thromboembolism (DVT) in the absence of prophylaxis, and the potential adverse effects associated with the use of pharmacologic prophylaxis. Routine use may in fact be harmful, particularly in patients at lowest risk for DVT. The final decision regarding use of pharmacologic prophylaxis should be agreed upon by the physician and patient after a discussion of the potential benefits and harms as they relate to the individual. Don’t culture or treat clinically uninfected lower extremity wounds with systemic antibiotics. Uninfected wounds are contaminated with surface flora and will yield false positive culture results. Furthermore, wounds that are not clinically infected do not require antibiotics and the unnecessary prescription of antibiotics may have harmful side effects and lead to further antibiotic resistance. Avoid ordering MRI in patients with suspected acute Achilles tendon ruptures. MRI is expensive and can lead to treatment delays. History and physical exam findings can establish the diagnosis of acute Achilles tendon ruptures in nearly all instances. Physicians should reserve MRI for atypical presentations and subacute or neglected ruptures when preoperative planning is needed. When physicians prefer to use the rupture gap (i.e., apposition of tendon ends) as criteria for management (surgery versus conservative treatment), dynamic ultrasound can be easily substituted. Don’t use synthetic or donated grafts on diabetic foot wounds without first allowing for an adequate trial of standard wound care. Most diabetic foot wounds will heal when proper wound care is performed. The standard of care includes treating any infection present, ensuring there is adequate circulation for healing, taking pressure off the wound (offloading) and regular debridement. Synthetic or donated grafts are expensive and are ineffective without first performing the standard of care. If a wound being treated with standard care has not healed by at least 50 percent in four weeks, synthetic or donated grafts may then be necessary. Don’t routinely use MRI to diagnose bone infection (osteomyelitis) in the foot. To learn more about APMA, visit www.apma.org. 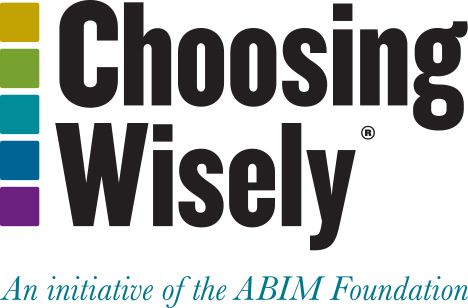 The American Podiatric Medical Association’s (APMA) Clinical Practice Advisory Committee, consisting of APMA members, board members, young members and liaisons with special interests in a variety of subspecialty areas within podiatric practice, formulated the recommendations for the ABIM Foundation’s Choosing Wisely Campaign. The Committee worked with podiatric colleagues to create an initial list of recommendations, which was reviewed and narrowed down to eight recommendations. The list of eight recommendations was further developed and distributed to the Committee for ranking in numerical order. Committee members were asked to rank the recommendations based on their relevance, timeliness, strength of supporting evidence and appropriateness for inclusion in the Choosing Wisely Campaign. The rankings and deliberation enabled the Committee to come to the final five recommendations, which were again reviewed to ensure appropriate evidence was used to support each recommendation. The final recommendations were approved by the Board of Trustees of the APMA before submission to the ABIM Foundation. APMA’s disclosure and conflict of interest policy can be found at www.apma.org. Fleischer AE, Abicht BP, Baker JR, Boffeli TJ, Jupiter DC, Schade VL. American College of Foot and Ankle Surgeons’ Clinical Consensus Statement: Risk, prevention, and diagnosis of venous thromboembolism disease in foot and ankle surgery and injuries requiring immobilization. J Foot Ankle Surg. 2015;54:497-507. Calder JD, Freeman R, Domeij-Arverud E, van Dijk CN, Ackermann PW. Meta-analysis and suggested guidelines for prevention of venous thromboembolism (VTE) in foot and ankle surgery. Knee Surg Sports Traumatol Arthrosc. 2016;24(4):1409-20. Robinson R, Wirt TC, Barbosa C, Amidi A, Chen S, Joseph RM, Fleischer AE. Routine use of low-molecular-weight heparin for deep venous thrombosis prophylaxis after foot and ankle surgery: A cost-effectiveness analysis. J Foot Ankle Surg. 2018;57:543-51. Lipsky BA, et al. 2012 Infectious Diseases Society of America Clinical Practice Guideline for the Diagnosis and Treatment of Diabetic Foot Infections. CID. 2012;54:132. Singh D. Acute Achilles tendon rupture. BMJ. 2015;351:h4722. Garras DN, Raiken SM, Bhat SB, Taweel N, Karanjia H. MRI is unnecessary for diagnosing acute Achilles tendon ruptures: clinical diagnostic criteria. Clin Orthop Relat Res. 2012;470:2268-73. Wallace RG, Heyes GJ, Michael AL. The non-operative functional management of patients with a rupture of the tendo Achillis leads to low rates of re-rupture. J Bone Joint Surg Br. 2011;93:1362–66. Snyder RJ, et al. The management of diabetic foot ulcers through optimal off-loading: Building consensus guidelines and practical recommendations to improve outcomes. JAPMA. 2014;104:555. Snyder RJ, et al. Consensus recommendation on advancing the standard of care for treating neuropathic foot ulcers in patients with diabetes. Ostomy Wound Manage. 2010;56:S1-24. Sheehan PS, et al. Percent change in wound area of diabetic foot ulcers over a 4-week period is a robust predictor of complete healing in a 12-week prospective trial. Plast Reconstr Surg. 2006;117:239S-244S. Rogers LC, et al. The Charcot foot in diabetes. Diabetes Care. 2011;34:2123.